Accretion onto black holes and neutron stars causes the infalling gas to heat-up and radiate. This X-ray glow is how we find and identify new sources. But radiation is not the only form of feedback into local host environments. Accretion also results in wide-angle disk winds, and collimated, relativistic jets of material. Exactly how disks and compact objects drive these flows of matter and energy (is black hole spin involved? ), and exactly how much mass and power are transmitted, are exciting questions that must be answered to understand the co-evolution of black holes and host galaxies. The best spectra are revealing new aspects of winds, and it appears that wind and jet modes are anti-correlated (if imperfectly). Coordinated studies of accretion and ejection hold potential. 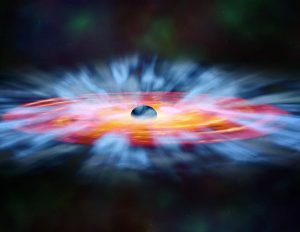 The ultimate goal is a complete description of radiation, winds, and jets, as a function of black hole mass, spin, and accretion rate; we have taken an initial step toward that goal.